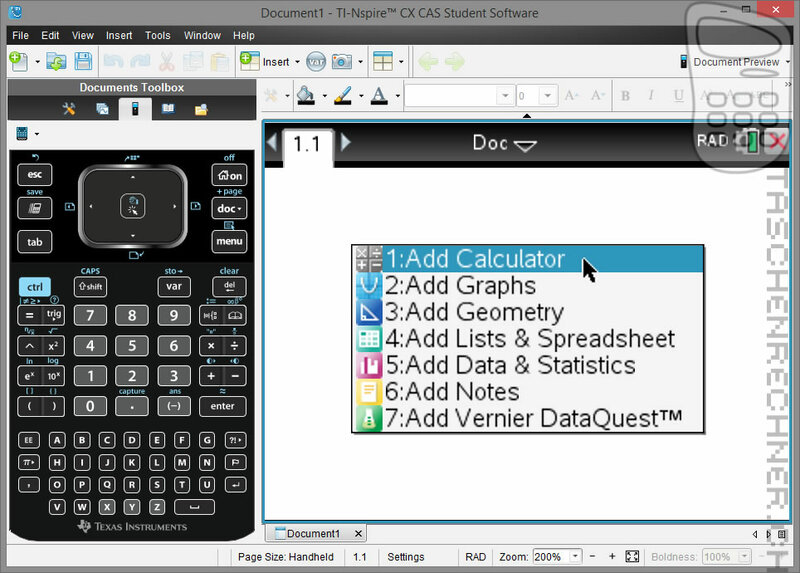 The TI-Nspire CX CAS Student Software offers an identical user interface and identical features and functionalities to the TI-Nspire CX CAS Handheld. The 100% compatibility of the Handheld and Software is the basis for a wide range of applications. The TI-Nspire CAS Student Software is available as a single use licence (ESD) and in various school and multi-use licences (ESD). Compatible with other devices in the classroom (PC, Nspire navigator system, Nspire docking station, beamer etc.). Please contact us for orders and any questions on these and other licences. Multi-use licence (volume) = licence for several workstations (e.g. for notebook carts). Only the number of workstations purchased can be installed. School network licence (concurrent) = licence for several workstations (e.g. in the computer room). The licence can be installed on as many computers as desired. However, only the number of licences purchased by the school can be used simultaneously. Example: A school has 50 computers and has purchased a licence for 10 computers. The licence can be installed on all 50 computers, but only 10 computers can work with the Software at the same time. Multi-use licences and school network licences can be purchased as permanent licences (no time limit) or as a subscription licence (licence for 1 year=365 days). Renewal is not automatic! Plug-and-play and ready-to-use with TI graphing calculators, the TI-Innovator Hub enables students to learn basic coding and design, use those skills to program and build working solutions. 2 in 1: Handheld + Software! TI-Nspire CX II-T CAS (graphing calculator with colour display and 115 MB RAM) + TI-Nspire CAS Software. TI-SmartView Emulator Software for the TI-84 Plus Family. Based on the TI-84 Plus family of graphing calculators, the TI-SmartView emulator software for the TI-84 Plus family of graphing calculators is an easy-to-use demonstration tool for leading the classroom instruction of Math and Science. The TI SmartView emulator complements classroom calculator use by using a projection system or whiteboard to show an interactive representation of the calculator. Emulator Software für TI-30XS/30XB/34 MultiView Schulrechner. Ideal für die Taschenrechner-Schulung im Unterricht! Emulator Software für TI-30X Plus/Pro MathPrint Schulrechner. Ideal für die Taschenrechner-Schulung im Unterricht! TI-Nspire CX numeric & CAS Software Lehrer-Version (inkl. TI-SmartView-Emulator) für PC & Mac (ab Mac OS 10.4). Bezugsberechtigt sind Schulen und Lehrer mit Schulnachweis!